Global Plano Sunglasses Market size was worth over USD 16 billion in 2016 and is foreseen to surpass 450 million units by 2024. Necessity for eye protection against harmful UV radiation has enhanced the plano sunglasses market growth. As per AOA, prolonged exposure to solar radiation increases macular degeneration risks. Shifting consumer preference for vision comfort and prevention from macular degeneration will drive the plano sunglasses market demand. Changing lifestyle and income trends has enhanced the demand for stylish plano sunglasses. Easy product availability at competitive prices through online stores and independent brand showrooms will propel the product penetration. Inclination towards sporty wraparounds, retro and cat-eye designs will support the plano sunglasses industry demand. Positive impact of media offering promotional campaign particularly in emerging economies is expected to drive the plano sunglasses demand. 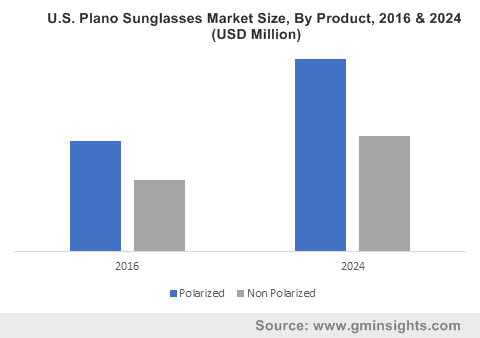 Moreover, new product launches and expanding brand portfolio to complement the changing demographic trends will create new opportunities for plano sunglasses market growth. Premium price trends particularly in Europe and the U.S. has enabled to be the major revenue contributors. Reduced spectacles usage due to contact lens penetration and emergence of advanced eye correction operations including LASIK will propel the plano sunglasses market growth. Rising demand for eye protection among the contact lens wearers will support the product demand. Increasing product scope in sports applications due to its superior resistance and UV absorption will drive the business growth. Favorable regulations in fitness and sports organizations for mandatory product usage will provide positive outlook for industry growth. As per reports, around 40,000 sports related eye injuries are reported every year in the U.S. Technological advancement in production process including press polish forming, vacuum forming and injection molding will propel the industry demand. Emergence of polarized products along with product innovations including anti-scratch and anti-glares has enhanced the product demand. Increasing R&D spending along with growing manufacturing facilities particularly in China, India and Thailand will fuel the product development. However, increasing dependency on spectacles due to visual deficiencies including myopia and hyperopia are the key factors restraining the plano sunglasses market growth. Polarized plano sunglasses market was valued over USD 10 billion in 2016. Reduced glare & eyestrain, improved safety and enhanced vision are the key product benefits stimulating the industry growth. However, less suitability during night driving, downhill skiing, traveling in airplane and viewing LCD screens may restrict the product penetration. Non-polarized plano sunglasses market will observe gains at 4.5% up to 2024. High product adoption due to significant benefits including reduction of visible light entering eye along with superior optical properties at competitive price will propel the industry demand. Polycarbonate will witness growth around 4.5% up to 2024. Reduced risk of eye damage and better visibility during travelling has enhanced the product scope. Strong outlook in products used in sports and leisure will support the industry demand. Polyurethane plano sunglasses market generated over 36 million units by volume in 2016. Increasing awareness among consumers about their looks due to changing lifestyle has provided new opportunities for the industry growth. Polyurethane offers better style and aesthetic appeal to customers. Moreover, high impact resistance and suitability in harsh weather conditions will drive the demand. CR-39 material will observe gains at 5% up to 2024. Improved transparency, UV protection, light weight and better resistance to impact & heat are the key factors enhancing the product demand. Independent brand showrooms market generated over 75 million units in 2016. High focus on single class of products, buying advices along with facilities for inspection are the key factors positively influencing the industry demand. The U.S. online stores will value over USD 1.6 billion by 2024. Increasing investment in logistics & warehouses along with expansion in overall e-commerce industry will fuel the product scope. Moreover, provision of multiple payment modes and product offers & discounted prices have enhanced the demand for online stores. Optical stores will witness gains exceeding 4% up to 2024. Increased purchasing options owing to availability of several brands in single store offering different designs and sizes will drive the industry growth. Asia Pacific plano sunglasses market was valued around USD 2.8 billion in 2016. Increasing safety awareness among consumers along with improving standard of living are the key factors fueling the industry growth. Presence of large consumer base along with increasing purchasing power will propel the product development. Europe plano sunglasses market was around 110 million units in 2016. Strong presence of major manufacturers along with high affordability of consumers will support the regional demand. The region is the major revenue contributor due to high selling prices of the premium products. North America plano sunglasses market, led by the U.S. for industrial eye protection market will grow at 4% up to 2024. Rising demand for visually attractive products along with widespread awareness for eye protection will drive the regional demand. Global plano sunglasses market share is consolidated in nature due to presence of few manufacturers holding major industry share. Luxottica Group, Safilo Group, Marcolin Eyewear, Kenmark, FGX International, Modo Eyewear, De Rigo Rem, Silhouette International and Vogue Eyewear are the key industry players. 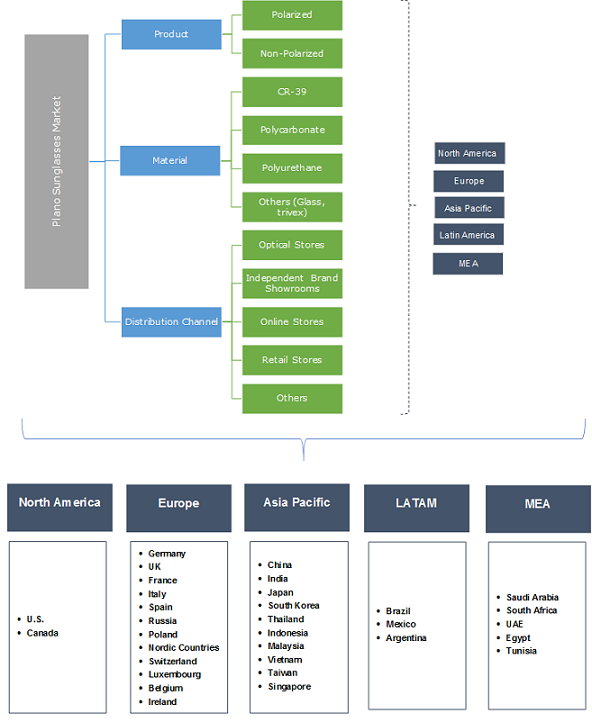 Luxottica dominates the industry holding, more than 50% of the global industry share in 2015. Companies have adopted key strategies including collaboration, mergers, acquisitions and new product launches to enhance the business growth. Increasing investments in research & development, quality control, marketing & sales, and supply chain & logistics to improve distribution channel will drive the demand. Globally, plano sunglasses forms an integral part of eyewear market and are expected to foresee considerable growth over forecasted period. Brand consciousness and increased purchasing power among consumers will boost the global industry size. The product is different from prescription or corrective sunglasses which is widely used among consumer, who prefer convenience of spectacles over contact lenses. High product usage despite of the unorganized sector due to significant brand value of the products are the key factors supporting the industry growth. Increasing issues associated with the usage of contact lenses including daily, weekly or monthly disposal and annual replacement cycles will drive the industry growth.